The blockbuster film has another groundbreaking night at this year’s awards. 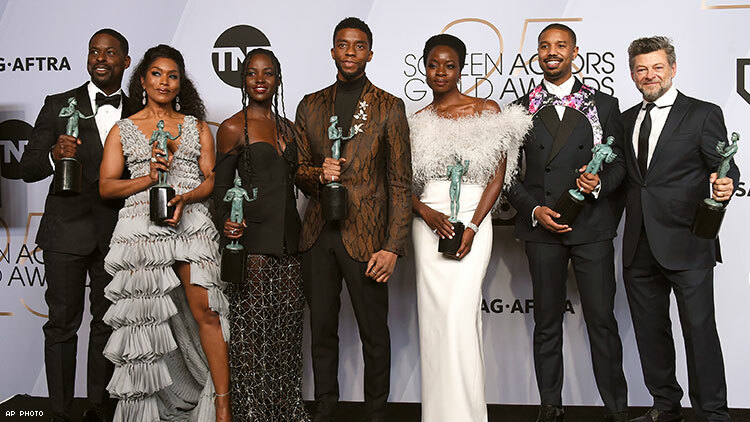 Disney/Marvel’s Black Panther won the SAG Award for Outstanding Performance by a Cast in a Motion Picture Sunday at the 25th annual SAG Awards, making it a serious contender for next month’s Academy Awards. “It’s a pleasure to be celebrated by you, to be loved by you — one thing I do know of it changed the industry is that you can’t have a Black Panther without a ‘2’,” he said of the sequel to the $1.45 billion mega-hit. Black Panther opened February 16, 2018 and has been a cultural phenomenon, grossing $242.1 million over that President’s Day weekend. Also, backstage tonight, Boseman took the opportunity to veer away from sequels to heap praise on the designers, costumers and craftspeople who created Black Panther’s fantasy world of Wakanda. ‘”I would say I don’t think people truly understand the amount of detail, the amount of mastery that went into the hair and makeup, wardrobe, set design,” he said. The movie is up for seven Oscars this year led by Best Picture, and scored several craft noms including Production Design, Costume Design, Sound Editing and Sound Mixing.